When I first went to Japan to study the way of tea, I didn’t know how to build a charcoal fire. My sensei really did not teach us how to do it. We would have a charcoal fire for events such as Robiraki or Hatsugama, but always the senior students were the ones who did it. One of the first lessons on building the fire, sensei taught us to choose the charcoal carefully. There are specific sizes in length and width for each piece and we had to learn the names of each one. We also had to learn the specific place each one had in the sumitori, the charcoal basket. Once we had chosen the charcoal, the next step is to wash it. This must be done very gently and carefully. The charcoal still has the bark attached to it and when you wash it, you must be careful that it doesn’t break off. Washing the charcoal minimizes the dust that causes sparks and the water adds oxygen to help the fire burn better. The charcoal should be dried overnight standing up on newspapers to help the water drain out of it. 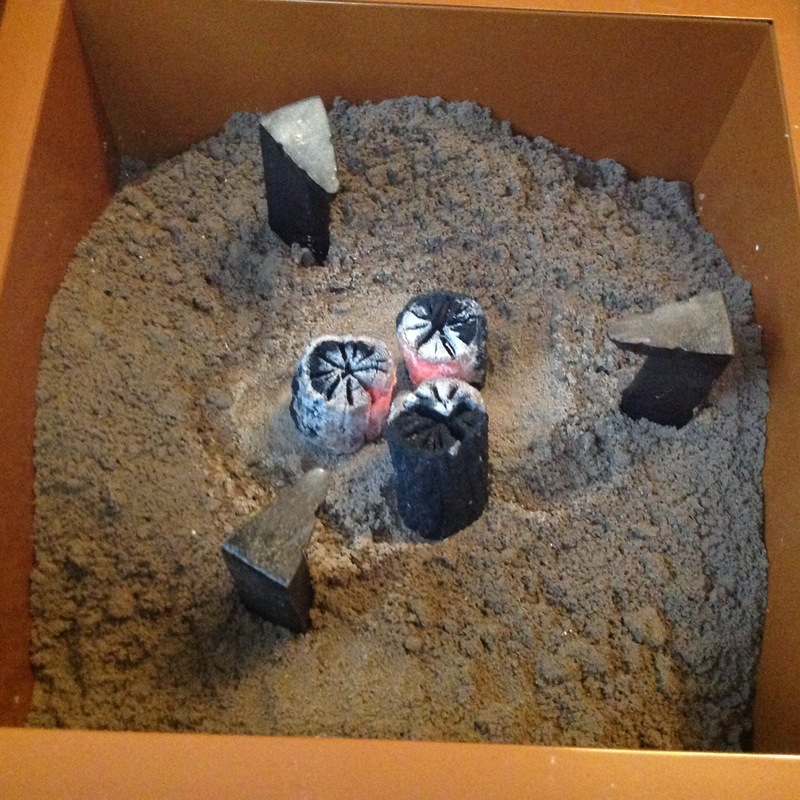 Next the charcoal should be arranged in the sumitori. As I said previously, each charcoal has a specific place in the basket and as you build the fire, it comes out of the basket in a certain order. 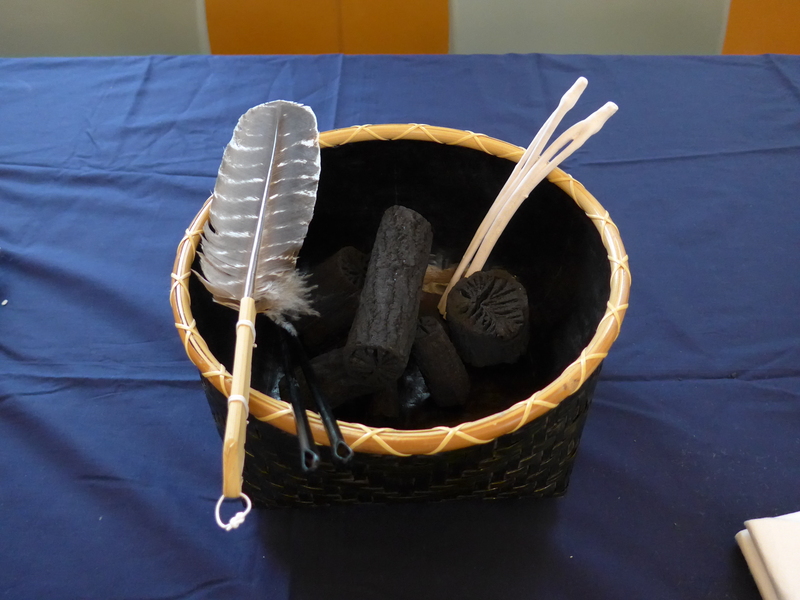 All of the rest of the fire building utensils are also arranged in the basket in a certain order so you can just take them out without fumbling around. Three pieces of charcoal are reserved for the shitabi, or starter charcoal. I remember sensei said that you must choose these shitabi carefully, especially in the furo season because the first fire is built after the meal is served. The shitabi must last through the meal to start the fire. Sensei said that the charcoal that isn’t perfect are the ones you should choose for shitabi. She said that the ugly ones with knots or twists have overcome hardship. These are the ones that last. Like people who have overcome hard times in their life, they are more resilient and better able to overcome obstacles and set backs. Those who have had an easy life may look good, but have a harder time dealing with adversity and burn faster. Light the shitabi, and put them in the furo or ro. Hopefully, your ash form will help the fire breathe and keep it alive until it is time for the first laying of the charcoal. When you lay the charcoal in the furo or ro, here are a few tips to help you build a better fire. Lay the charcoal so that they touch each other. If they are too far apart they will not catch fire. Also do not lay them too close together or they will smother and go out. By giving some space at the bottom near the ash, the air can get in to make the fire burn. 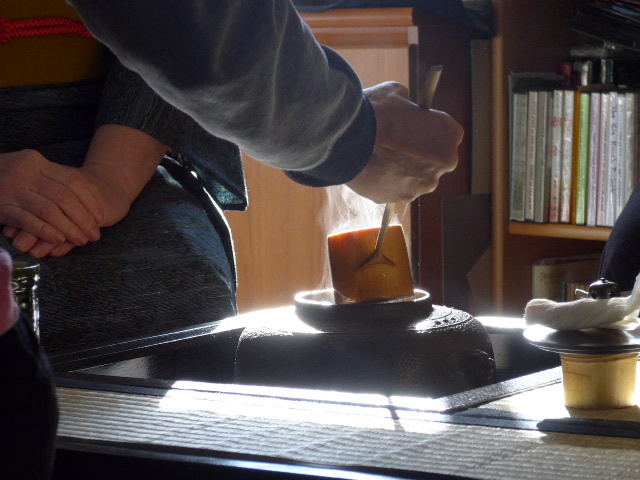 Most of the charcoal should be placed inside the gotoku (trivet). Avoid placing the charcoal too high that it touches the bottom of the kettle. The charcoal fire is the timing device for the chaji. 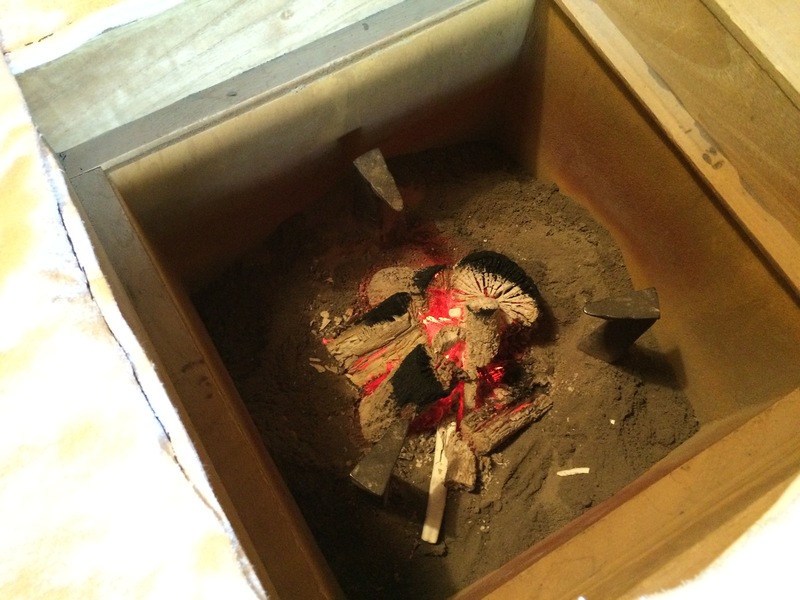 The two layings of charcoal bring the fire to the perfect temperature to make the koicha, then you rebuild it and make usucha. When the fire dies down, you will know it because the sound of the boiling kettle stops. If the guests are paying attention, this is the signal to hopefully wrap up and not inconvenience the host to rebuild the fire to finish the tea. It takes practice to build a good fire. It is a good idea to observe how the fire has burned when you take the kettle off at the end. It is also good to remember that no matter how beautifully you lay the charcoal, it is no good unless it can boil the water.